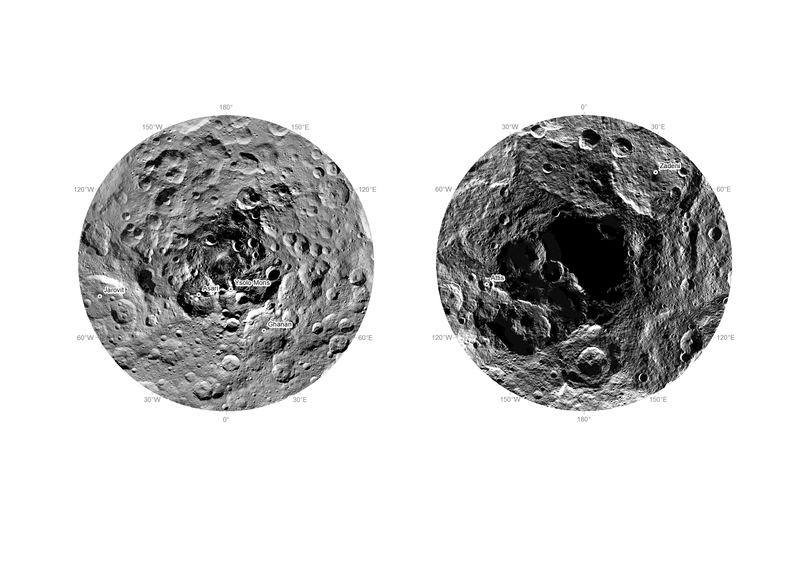 Researchers from NASA's Dawn mission have composed the first comprehensive views of the north (left) and south pole regions (right) of dwarf planet Ceres, using images obtained by the Dawn spacecraft. The images were taken between Aug. 17 and Oct. 23, 2015, from an altitude of 915 miles (1,470 kilometers). The region around the south pole appears black in this view because this area has been in shade ever since Dawn's arrival on March 6, 2015, and is therefore not visible. 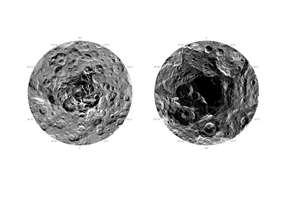 Detailed maps of the polar regions allow researchers to study the craters in this area and compare them to those covering other parts of Ceres. Variations in shape and complexity can point to different surface compositions. In addition, the bottoms of some craters located close to the poles receive no sunlight throughout Ceres' orbit around the sun. Scientists want to investigate whether surface ice can be found there.